Create a sustainable HP environment that systematically produces world class performances. Increase the number of swimmers with FINA A and FINA B times. To improve swimmer’s time from qualification event to pinnacle event. Who are the Targeted Athletes? 2020 (Tokyo) athletes – Athletes who are tracking on current performances to reach a minimum of top 16 in Tokyo, or who have until recently tracked within the top 16 in the world. Athletes meeting 2024 Target Athlete criteria who demonstrate evidence to warrant ‘fast track’ into 2020 programme. 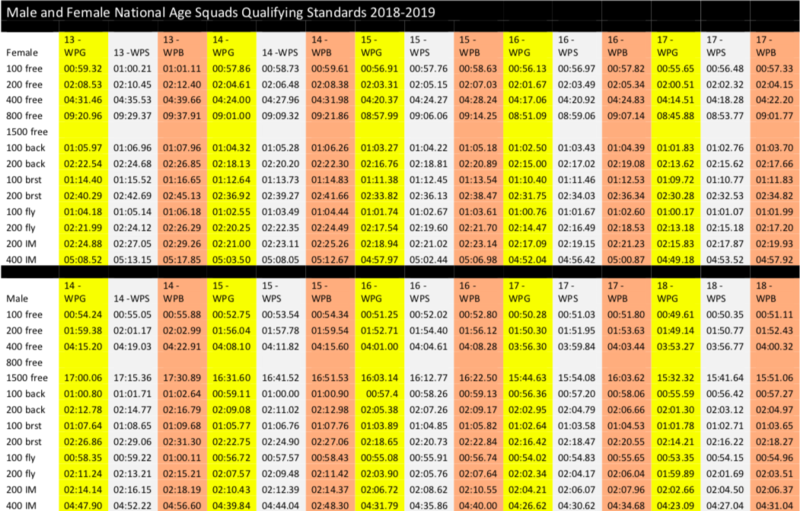 2024 (Paris) athletes – Athletes in the 15-19 (Female) and 16-20 (Male) who track within the top 150- to top 30 on World rankings depending on age, match the worldwide trends of performance improvement and who are demonstrating the key process skills required for continued world class development. 2028 (LA) athletes – Athletes aged 12-14 (Female) and 13-15 (Male) currently displaying the attributes identified as key elements for LTAD into High Performance, and/or already demonstrating performance improvement patterns that match worldwide trends for world class performance. 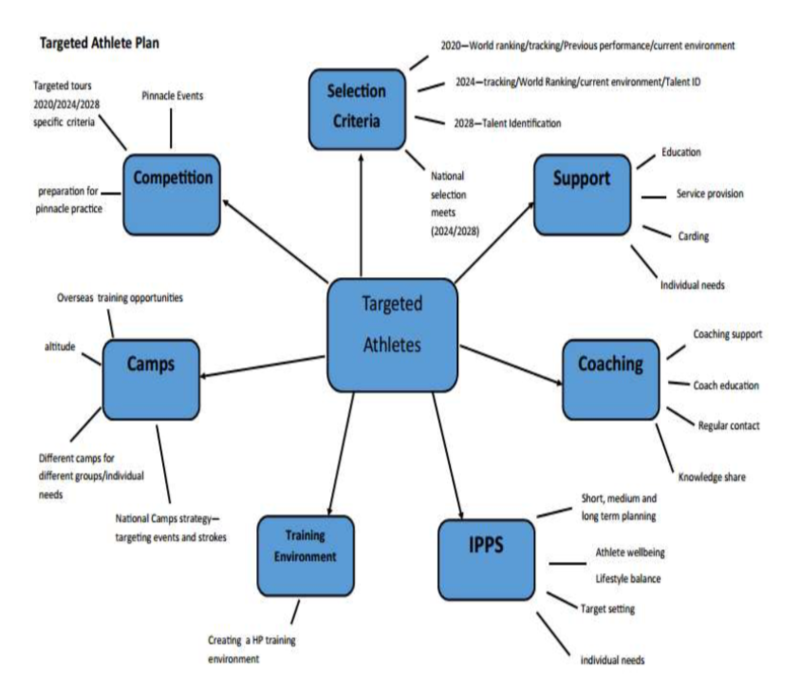 How many athletes are currently identified as target athletes - and where they sit on the pathway. World ranking -Athletes must track towards top 16 at Tokyo to be eligible for selection through these criteria. Athletes who are in the 2024/2028 target age bands who are tracking in between the top 100 and top 30 in the world may also qualify under these criteria. Tracking data - Used for the above selection criteria, and to demonstrate rapid rate of improvement/stagnation, and to identify weak events that may allow NZ opportunity and the need to target specific types of athlete. Previous Performance - Swimmers with previous good tracking and top 16 performance levels may be selected if they can show evidence to back up claims of top 16 capability. Current Environment - Athletes must demonstrate a HP environment or a desire to create one. For 2020 athletes this is simple – they need to be in an established senior programme or an age group programme that provides enough individual support for that athlete. They need access to athlete support services and must also display a HP lifestyle. 2024 and 2028 athletes need to be in development appropriate environments and need to be following the most appropriate athlete education programme to develop these vital criteria. Talent Identification - Athletes in the 2024/2028 programmes may be selected if they meet these criteria. TID will look at individual development and early performance standards set against data from previous athletes, environment, coachability, physiology and biomechanics. National Selection meets - 2024 and 2028 Athletes could be selected partly through performances at designated meets and/or via selection camps. This is still possible criteria at this stage. Each athlete will have different needs of the programme. Because athletes will come from all across NZ as well as some from overseas this support will need to have a clear pathway of communication between athlete and coach, and the TACM and the HPSNZ lead for the particular services. The athletes’ individual circumstances will need to be looked at carefully. Where circumstance and performance level warrants, support can be given to the swimmers’ coach and programme, either to improve the training environment, offer coach support and or education, or link to mentor support for either or both athlete and coach. This can only be achieved through regular and robust communication between the athlete and the TACM. For athletes clearly identified as top 8 or better potential, the programme will make every effort to support the development or continuation of a High-Performance environment around the athlete. Providing a tight, highly skilled local APS network with excellent communication with the national HPSNZ APS leads. Offering funding support to ensure training environments are as performance friendly as possible. Campaign support (HP Campaign Consultants). IPP’s will form the basis for a longer-term plan and the vehicle from which to levy the required support. Discussions with the athlete and their coach by the TACM will enable a clearer picture of how support can most effectively be delivered and enable clear performance tracking. The IPP will also enable the athlete to set down clear targets and goals for a healthy lifestyle balance and personal well-being. The TACM will be able to ensure that the athlete is being exposed to a High-performance training environment, through the IPP discussions and clear goal setting and needs analysis with the athlete and their coach.The programme will look to address targeted areas for development with both individual athletes and the wider programme, through introduction of specific event and stroke camps. Athletes will be invited to attend with their coaches so data can be compiled along with the development of new strategies for improving the performances of NZ swimmers in specifically targeted events. This is an extension of both service provision through access to Biomechanical and physiological resources as well as developing coaching strategies and monitoring individual performances. All future NZ designated pinnacle events/ training camps/tours will be structured to complement the Targeted Athlete programme. No event selection criteria will be established without the relevance to the long-term goal of achieving world class performance. Criteria must reflect the age and development level of the targeted athlete, the purpose of the competition or camp or tour and its place within the long term SNZ swim calendar. The level of support targeted athletes can expect at each stage of the pathway. Athletes who recently were tracking towards top 16 but now are currently only at FINA A standard. These athletes will be selected from performances at the 2018 Commonwealth Games and the 2018 Pan Pacific Games. Athletes currently tracking towards top 16 at the Tokyo Olympics and who are in the 2024 Target Group Age range. The 2024 and 2028 Targeted Athletes will be selected from performances at National Age Groups, National Open Championships and other significant International events in 2018. They will be selected based on the criteria set down in the new National Squad Selection Standards 2018/19. SILVER standard – Swimmers whose best performance is within 1.5% of Gold standard. BRONZE standard – Swimmers whose performance is within 1.5% of Silver standard. Gold Standard swimmers will be the targeted athletes and will remain on the targeted programme for a minimum of 2 years (we know there can be a fluctuation in performance from year to year throughout the development period). 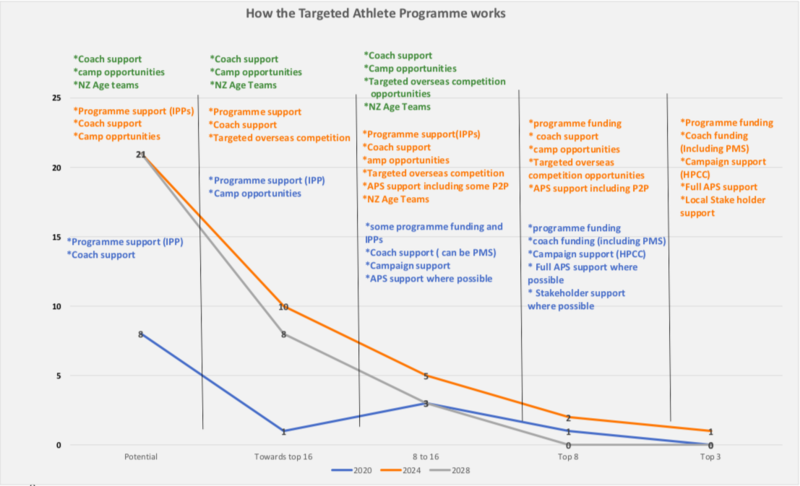 Athletes can move from the silver stream into the Gold stream during any period and they will then be picked up on the Targeted Programme radar. Maintaining and developing athlete potential – through monitoring performance, exposure to National Camps and National Junior teams to Junior pinnacle events, as well as Targeted Programme Camps such as 2024 European Tours and 2028 US Tours. Developing the coaches of the Targeted Athletes so they can sustain development. The current data shows us that there is a drop-off of swimmers from the Gold level from 16 years onwards. Therefore, programme development through coach education is vitally important.